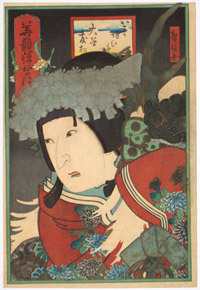 The actor Kataoka Gado II as Honchomaru Tsunagoro in the play Honcho itoya no musume performed at the Chikugo theatre in 8/1849. From the set: Date kurabe kyokaku den, “A Comparison of the Stylishness of Famous Gallants”. Fine deluxe surimono-style impression and colour. Margin trimmed to black line at left, otherwise fine condition on deluxe hosho. Signed Kunimasa monjin Masuharu ga ( “Masanobu pupil of Kunimasu” ). 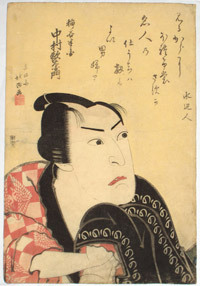 The actor Arashi Rikan III as Ukiyo Tohei in the kabuki play Sendai Hagi performed at the Onishi theatre in 3/1848. From the set: Date kurabe kyokaku den, “A Comparison of the Stylishness of Famous Gallants”. 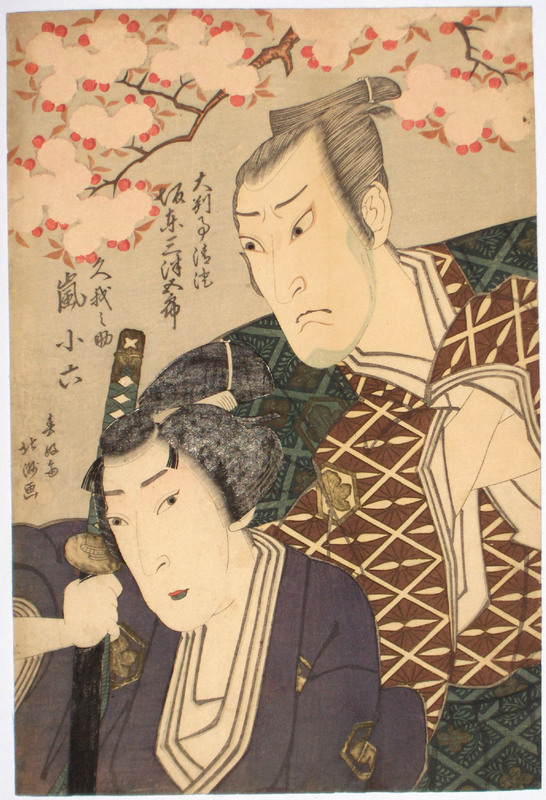 A hosoban kappazuri print (stencil print) showing the actors Ichikawa Danzo IV, Yoshizawa Iroha I, and Arashi Kichisaburo II as Shurinosuke, his wife, and Toshihiro. Exceptionally rare: Seemingly the only other impression known is illustrated in 200 Years of Kamigata Ukiyo-e, 1975, no. 39. Published 1803. Publisher unread. Very good impression. Fine colour. Very good condition. Signed Nagahide. 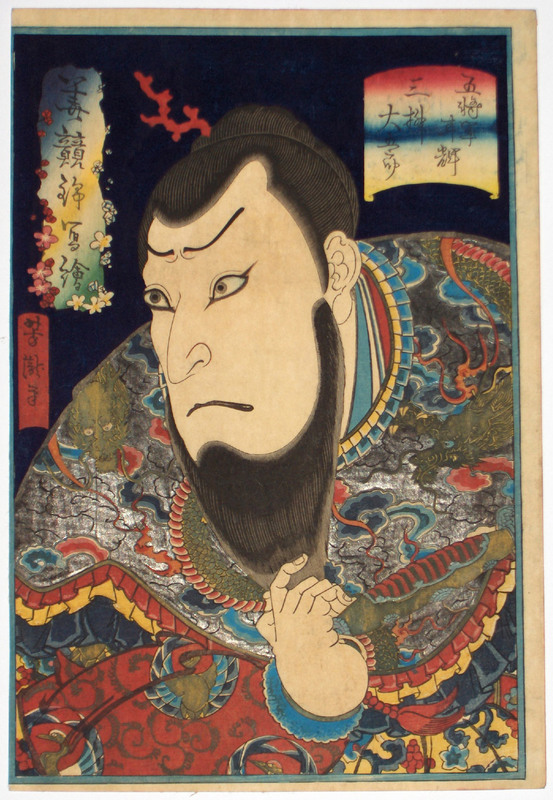 A large head oban print of the actor Onoe Shogyoku in an unknown role from a rare set: Zen (?) 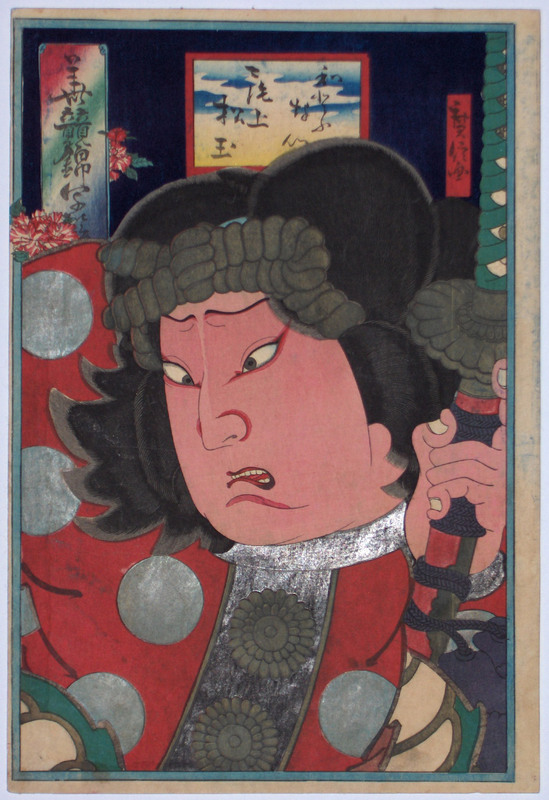 kurabe nishiki utsushie, “A Comparison of Virtuous Pictures.” Published c1859. This is the first deluxe edition with extensive burnishing, gold and silver. The set was reissued without these embellishments. Very fine impression and colour. Some soil, offsetting and slight trimming. 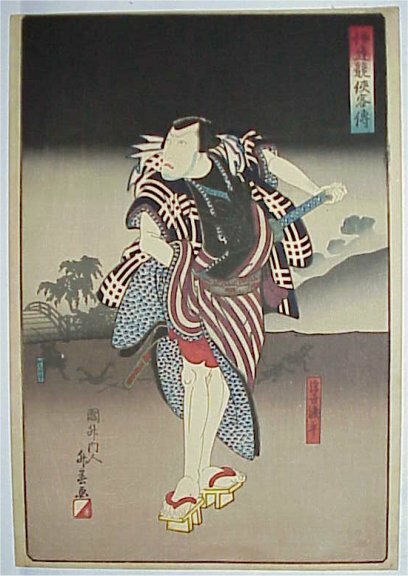 Signed Hironobu ga.
A large head oban print of the actor Nakamura Kanjaku II as Takeda Katsuyori (?) from a rare set: Zen (?) 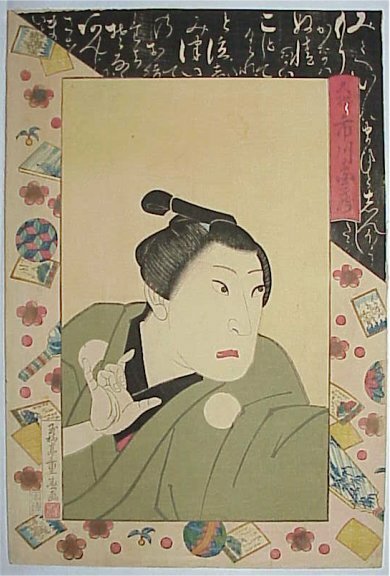 kurabe nishiki utsushie, “A Comparison of Virtuous Pictures.” Published c1859. This is the first deluxe edition with extensive burnishing, gold and silver. The set was reissued without these embellishments. Very fine impression and colour. Some soil, offsetting and slight trimming. Signed Yoshitaki hitsu. A large head oban print of the actor Otani Tomomatsu I as Yaegaki hime from a rare set: Zen (?) 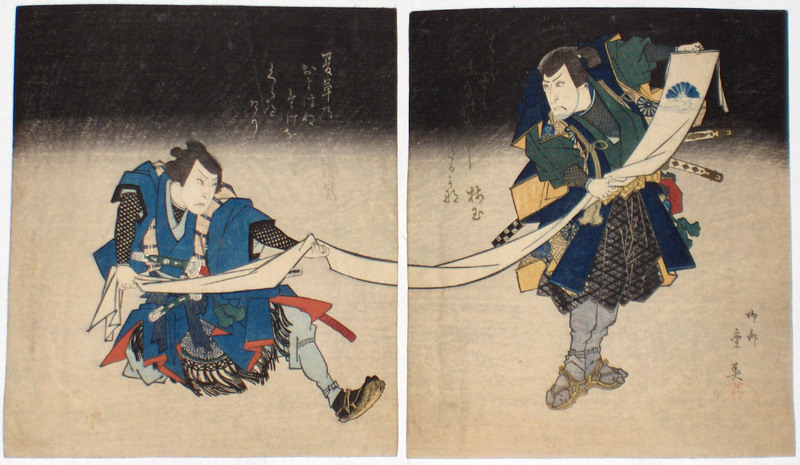 kurabe nishiki utsushie, “A Comparison of Virtuous Pictures.” Published c1859. This is the first deluxe edition with extensive burnishing, gold and silver. The set was reissued without these embellishments. A large head oban print of the actor Arashi Tokusaburo II ( or III [?] ) as Hangari on’na from a rare set: Zen (?) kurabe nishiki utsushie, “A Comparison of Virtuous Pictures.” Published c1859. This is the first deluxe edition with extensive burnishing, gold and silver. The set was reissued without these embellishments. A large head oban print of the actor Sancho Daisho (?) as the pirate Watonai ( Kokusenya, Coxinga ) from a rare set: Zen (?) 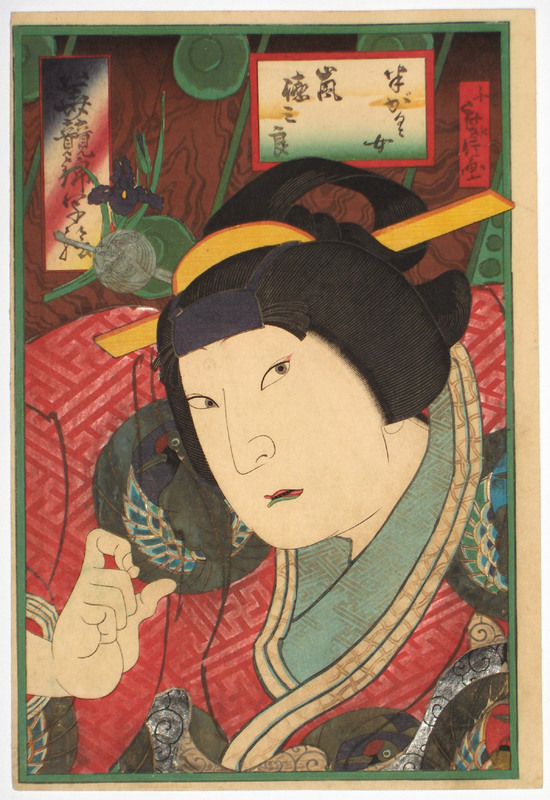 kurabe nishiki utsushie, “A Comparison of Virtuous Pictures.” Published c1859. This is the first deluxe edition with extensive burnishing, gold and silver. The set was reissued without these embellishments. A surimono diptych of actors. Shigeharu, according to contemporary accounts, was the only professional full-time actor/print designer. 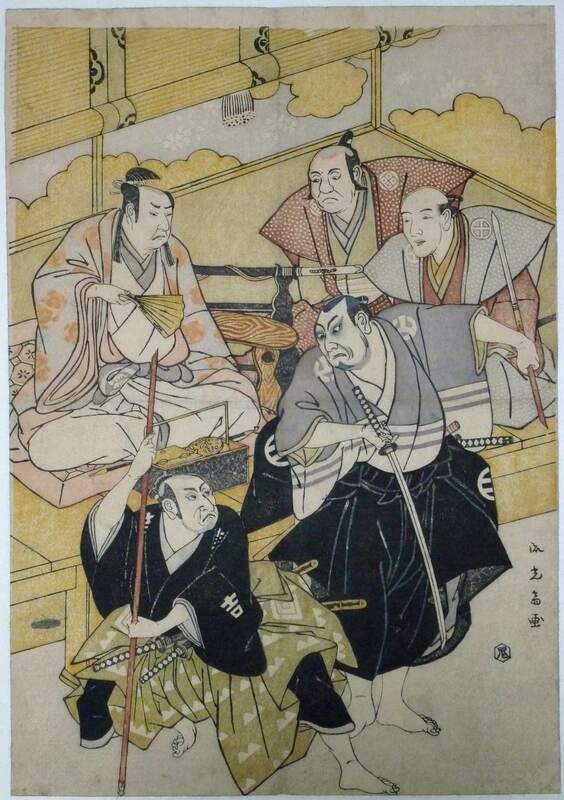 True shikishi-ban Osaka surimono are extremely rare: Anecdotally there are supposed to be some others in the vaults of the Victoria and Albert Museum, London. Fine impression with burnishing, silver and gold. Fine colour. Light backing with slight offsetting au verso, otherwise good condition. Signed Ryusai Shigeharu. 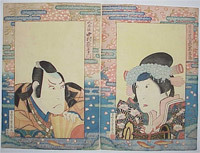 The complete oban diptych showing ( right ) a bust portrait of Onoe Kikugoro III as Shizuka no Mae and ( left ) a bust portrait of Nakamura Utaemon III as Kitsune Tadanobu in the play Yoshitsune senbon zakura, “The Thousand Cherries of Yoshitsune” performed 10/1830. Illustrated complete in colour in Dean Schwaab, Osaka Prints, 1989, no.141, p.150 and also on back jacket. Fine impression, colour and condition. Full size. 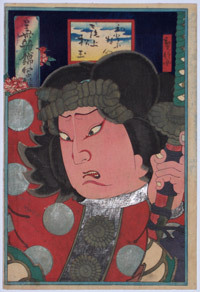 Signed Gyokuryutei Shigeharu ga.
An extremely rare early Osaka hosoban showing the actor Asao Tamejuro II (1779-1806) standing before a broken barricade in the role of Yamashiro Kantsubo in the play Meiboku sendai hagi. This artist and print appear to be unrecorded. 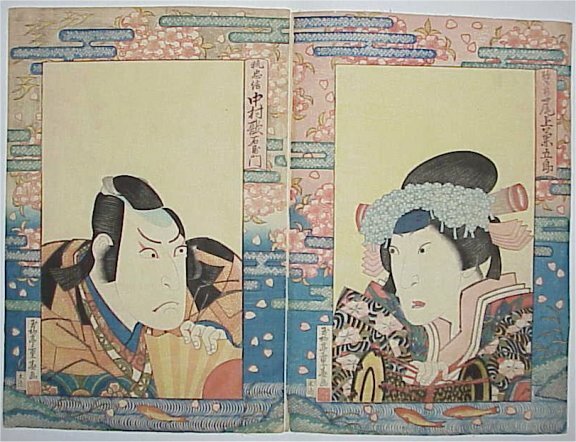 Published by Houki (Honya Kichisai), c early 1800. A wonderful design. Many thanks to Hendrick Luhl for his help on this print. Very good impression and colour. The fujitive background aobana, dayflower pigment, intact except for one small area affected by moisture visible au verso. Very good condition. Signed Sesshunsai ga with seal unread. The most important and influential Osaka artist of the late eighteenth century. An innovator whose style may well have influenced such artists as Shunei and Sharaku. His prints – mostly hosoban – are all of the utmost rarity. Indeed, it is thought, as here, that they originally formed triptychs but, so far, no complete design has been located. 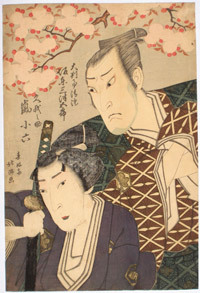 The unsigned left panel of a triptych published 1/1793 showing Onoe Shinshichi I (Fujaku) as Isshiki Yukinokami in the play Keisai yanagi sakura. 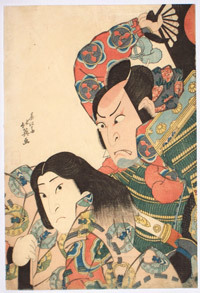 The play involves the rescue of the Ashikaga Shogunate through the efforts of Yukinokami in uncovering a usurper’s plot. The hero stands in a snowy garden holding a fragment of a handscroll he has been found reading. 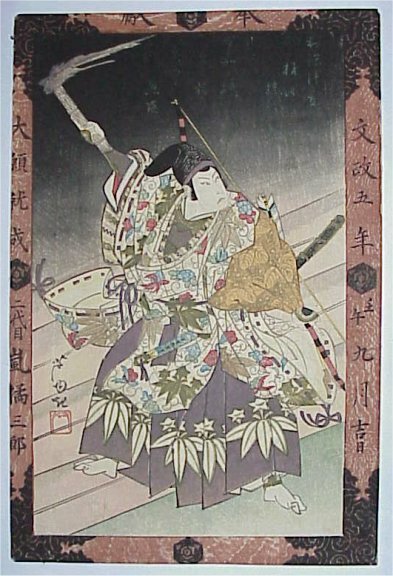 Of the utmost rarity: Only a few impressions are known and there are two states: As here without role above and published by Osakaya Sashichi and with the calligraphy and published by Shiocho. Fine impression, colour and condition. 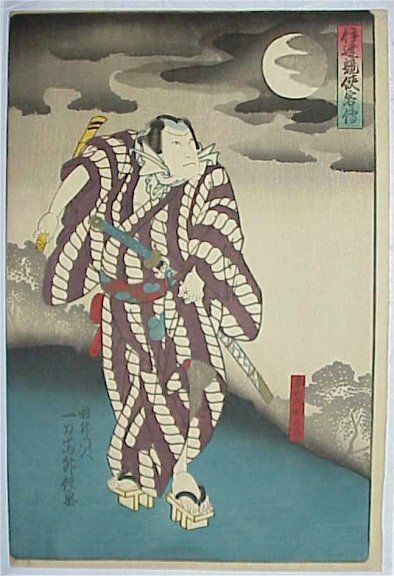 An extremely rare and early Osaka hosoban (probably unrecorded) showing the actor Kano Hinasuke I (who later became Arashi Koroku III) standing on large geta and holding an umbrella. Published by Shioki-han (Shioya Kisuke), c 1782. The poem above is signed using the actor’s hango Arashi Minshi. Only a few designs are known by this artist. Many thanks to Hendrick Luhl for his help on this print. Very good impression and colour. Some wear and tear which has been skilfully restored. On very thin paper. Signed Togakusai hitsu with seal Sadakuni. A bust portrait of the actor Arashi Rikan in an onnagata role as Osome. Published by Honsei c1830-32. A border of game cards, balls and battledore and shuttlecock. Forms a complete diptych design with print below. Very good impression, colour and condition. Full size. 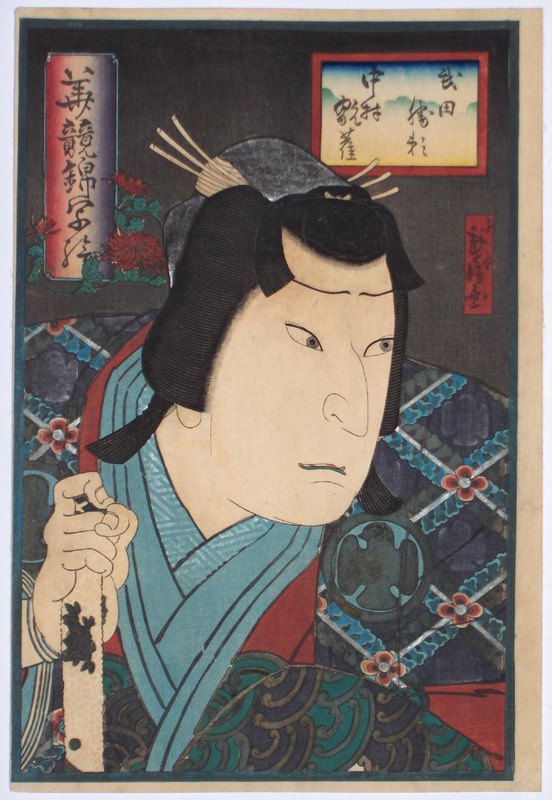 Signed Gyokuryutei Shigeharu ga.
A bust portrait of the actor Ichikawa Danzo in the role of Hisamatsu. Published by Honsei c1830-32. A border of game cards, balls and battledore and shuttlecock. Very good impression and colour. One very small wormhole and minor marks, otherwise very good condition. Full size. Signed Gyokuryutei Shigeharu ga. The actor Arashi Kitsusaburo II as Minamoto Sanmi Yorimasa about to kill the composite beast, the Nue, with an arrow. 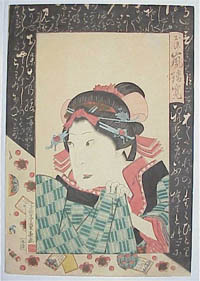 Dated Bunsei 5, 9th month (1817). Very good impression and colour. Deluxe printing on heavy hosho. Very good condition. Signed Ashiyuki.